Westosha’s Josh Leslie turns a double play in a game against Wilmot last season. The infielder, and three key pitchers, will lead the Falcons charge (File Photo). 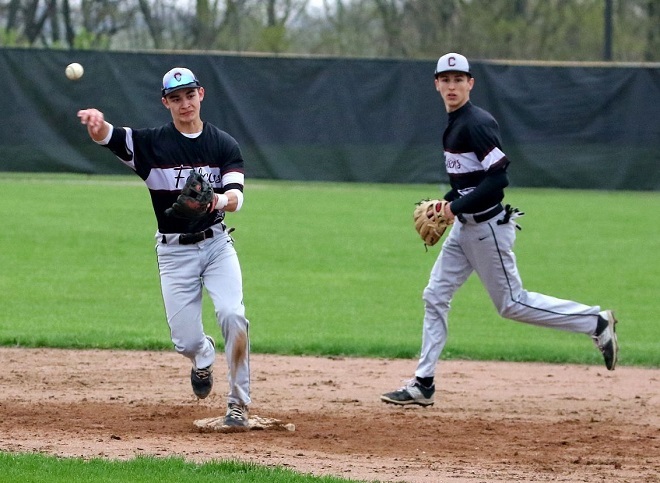 With the loss of eight seniors from last year, including current Division 1 Creighton University catcher Garrett Gilbert, Westosha Central High School baseball coach Jacob Morman will look to infielder Josh Leslie and a strong core of returning pitchers to lead the 2018 squad. Westosha Central, which finished 8-6 in Southern Lakes Conference play and 11-15 overall, will also have a handful of newcomers to the team. Glidden, the team’s leader on the mound, struck out 28 hitters while walking 10 through 27.6 innings where he tabulated a 2.53 ERA as a sophomore. Meanwhile, for Salerno, as a sophomore, he logged a team-leading 34.2 innings, and held hitters to a .212 batting average while producing a 3-2 record. Anderson, a junior, fanned 12 hitters and issued just eight walks in 29.1 innings last year, where he accounted for a 2.15 ERA. Along with the trio, Morman will look to sophomore Cooper Griffiths and junior Jefferson Kearby to reinforce the pitching staff. While Morman believes in his pitching nucleus to deliver, all-SLC first team shortstop Josh Leslie returns for his senior season, a year after he batted .416 with 37 hits, 23 RBIs and collected 11 doubles along with a team-leading 11 stolen bases through 26 games. Additionally, Leslie showed discipline at the plate, where he drew 10 walks compared to five strikeouts for a .471 on base percentage. Leslie, according to Morman, has led by example during off-season workouts, which has carried into early season practices. Along with Leslie and the three pitchers, Morman has another returning letter-winner, outfielder Sam LeFebve. Gone to graduation, along with Gilbert, are two other players competing at the collegiate level, including Jack Schroeder (Wisconsin Lutheran College and Bryce Edwards (Carthage College). The other four are Tanner Bykowski, Trent Jones, Parker Krumm, Austin Podella and Jake Werth. Morman, however, will look to filling the void left by last year’s senior-laden team with promising newcomers. Newcomers are Samy Greco (junior, outfielder), Myles Kazumura (sophomore, catcher/infielder), Andrew Hrncar (sophomore, outfielder), Reid LaBell (junior, outfielder), Bryce Kerkman (sophomore, pitcher/infielder) and Gage Mickelson (junior, outfielder/catcher). As Morman looks ahead at the SLC slate, including Burlington, which reached the WIAA Division 1 state tournament last year, he sees any team capable of taking control of the conference title.